Lately, as I scroll Pinterest and Facebook I have been seeing one item promoted, again and again, the DockATot. It also seems to be in just about every mom bundle giveaway I see on Instagram. 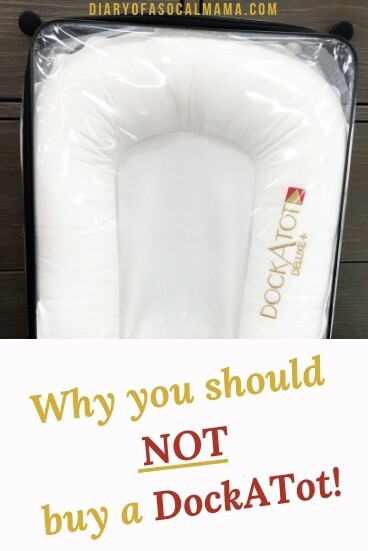 With all these posts and articles out there promoting use of the DockATot I felt compelled to write a counter piece explaining why I think you should NOT use a dock a tot for your child due to safety concerns. I’m no fan of mommy shaming but I am a fan of education and the phrase “know better, do better”. I’m in a lot of mom groups online and I frequently see people say we did it and my child is fine, which they apparently think is evidence that a product, practice, etc. is safe. This sort of anecdotal science is however NOT evidence that a product or practice is safe. There’s a term for it “survival bias”, which occurs when you ignore those that suffered because you personally, or a vast majority did not suffer from a certain behavior. Our parents rode in cars without car seats but most of us wouldn’t consider letting our own children ride in cars this way. Yet we often put our children to sleep in unsafe ways. Often, the risk, percentage-wise, is quite low and it’s up to each mom to decide what risks they are willing to take. Unfortunately, there are moms who are in that small percentage that suffer terrible tragedies. I don’t want to see someone suffer a tragedy or near tragedy and not even know that they were taking a risk. That’s why I’m always compelled to comment and share facts about the risks when I see someone suggesting the use of this and other unsafe products. For those who are not familiar a DockATot is a product that resembles an inflatable pool bed. It has a flat but soft center with large rounded sides. The item is promoted as being for “lounging, supervised napping and tummy time, co-sleeping, changing diapers, cuddling and playing” according to the company website. Using this product for sleeping or co-sleeping is where the problems lie. They do say not to use the product in a crib, I’m not sure why they think it’s safe to use on an adult bed while co-sleeping but not in their own crib, but these are the warnings the manufacturer gives. 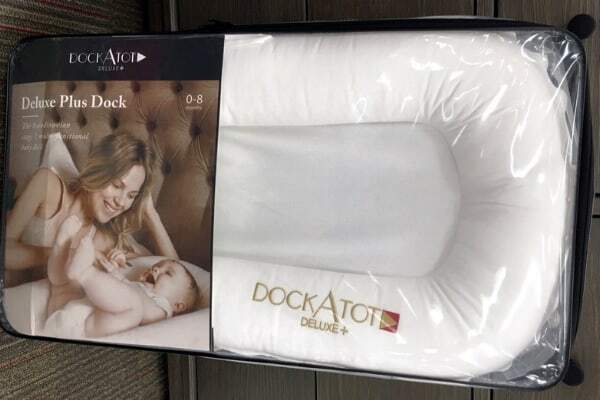 While DockATot is the official product name you will more likely see it online as dockatot, dock a tot, or even baby nest which refers to the larger category of products it’s similar to. DockATot safety issues, as I said, is the main thing that compelled me to write this post. The danger of the DockATot, and other prodcuts similar to the DockATot, often referred to as baby nests, is due to a risk of possible suffocation. Your child could roll or turn their head into those soft sides and suffocate. Babies don’t have a lot of head control and can easily get stuck in a position. If being used to co-sleep (used on an adult bed where parents or other caregivers are also sleeping) an adult could roll onto the side or put their arm on the side causing the “nest” to tilt and the baby to roll into the sides. Often baby nests and positioners are promoted as being made of “breathable” fabric. Put a thin blanket over your face and try to breathe. I’m guessing you’ll find it makes breathing harder and a bit uncomfortable. These products are made of a thicker fabric than that and your baby has a much smaller mouth, nose, and windpipe. I can easily imagine that it would be quite difficult to breathe with ones face pressed into such fabrics. The phrase breathability actually just means that water vapor can pass through, not that you can breathe well through it. If you’re in Canada you are actually unable to purchase a DockATot currently. The Canadian government is reviewing such products and has released a warning about their use. Until they decide otherwise they have banned the sale of such items. While the company website claims the item has passed many safety regulations, none of those regulations have anything to do with being a safe place for an infant to sleep! Baby Bargains did a great post that talks more about these safety guidelines it passes. The safest way for your baby to sleep according to the AAP (American Academy of Pediatrics), you’ll also find similar recommendations in other countries, is flat on their back on a firm surface in their own sleep space. This means not co-sleeping with adults or in baby nests like the DockATot. RocknPlays are also not suitable for sleep and provide dangers of their own. In the early days, a bassinet or pack and play are great options for keeping baby close to you for those middle of the night wake-ups while still providing the safest sleep space possible. Their bed should also be free of blankets, pillow, bumpers, etc. The crib, bassinet, or pack n play should be bare, just a firm mattress covered with a tight-fitting sheet. Some babies do respond better to feeling like they are enclosed, this is the feeling many baby nests like the DockATot or sleep positioners are trying to achieve. You can replicate this feeling by swaddling your baby or using a specially designed swaddle blanket if you’re like me and my husband and can’t seem to achieve the swaddle without the help of velcro or zippers. Breastfeeding? The items mentioned above still work great! I too often see people claim that you can’t breastfeed successfully without bed sharing. But you definitely can. I nursed my daughter for 18 months and we never co-slept. A bassinet can fit very close to the bed allowing you to easily pick baby up to nurse and then return them to their sleep space. The Halo bassinet is very popular. I would get one if I wasn’t so cost conscious. The pack n play with a bassinet level is great because you can use it long term, so versatile! One item that is NOT a safe alternative is a Rock N Play, which carries it’s own safety risks. Items that are labeled as a crib, bassinet/cradle, or playard DO pass current safety standards. These terms are regulated by the CPSC (Consumer Product Safety Commission) in the United States and must meet certain safety standards to use those terms. Already had your baby? Learn about these simple activities to do with your infant. Why do I see it promoted everywhere? Money. The main reason is money. The company who makes and sells the DockATot has put a lot of money into advertising their product. Companies can sell whatever products they want and say what they want about them. Unless they get sued or the product becomes a big enough issue that the government steps in they will keep doing what produces profits. Which means they can claim a product is “safe” and it’s on the rest of us to prove that it’s not. Which means, babies have to potentially die to prove that this item is unsafe. Money is also the reason you see a lot of articles online in other blogs suggesting you get a DockATot. At the top of these articles, you will often see a disclaimer that this is a sponsored post but opinions are their own. This means that DockATot paid that person to write an article about their product. Some of these writers may have used the product themselves, others are just looking to make some money by writing about it. I like to think many of them don’t know the dangers or used it after making an educated choice but unfortunately, there are also those who will promote any product if they can get paid to do it. I was not paid to write this article. I did consult with members of the Safe Sleep Group online. The alternative products listed above are also affiliate links so if you were to purchase one I’d get a small commission. This is how many website owners are paid for their work. However, these products do all follow the current safe sleep guidelines. I can’t say I’ve never promoted an unsafe product but I’d never do so knowingly and try to give warnings where appropriate. It works for some moms. You hear lots of other moms promote the DockATot because it supposedly worked for them. They were not in the small percentage who lost a child due to unsafe sleep conditions. Many either took a calculated risk or more likely, have no idea there was a danger to using this product. They assume, like many of us, that if a baby product is on the market then it’s safe. Lack of knowledge. In both of these cases, I think lack of knowledge (mixed with marketing) is the main reason it’s promoted so much. As moms of young children, we are desperate for sleep. If we hear something might help us get more sleep we often jump on it without the time or willpower to research the product first. I hope the information I’ve provided helps you to make an educated choice about what the best products are to use for your child. Specifically, in choosing whether or not to purchase a DockATot. If you’re interested in reading a more in-depth look at the DockATot and it’s marketing discrepancies check out this article from Baby Bargains or join the Safe Infant Sleep Group on Facebook for great, no-nonsense, fact-based advice about the safest way for your baby to sleep. Please pin or share this article so other moms and moms to be can have this information! I used my doc a tot from 3 to 8 months.. but I had a thick planked surrounding so she could not roll over.. I was naturally up every hour.. so sorry for your loss. I have seen these a lot online and my suspicions regarding safety were exactly what you wrote about! For parents wishing to bedshare, there are many resources out there, none of which that promote positioners or items like the one you mentioned. We managed fine with the portable pack and play! I’m so sorry for your loss…I can’t imagine how difficult that is. Following the ABC’s of safe sleep, alone, on their back, in a crib or other safe sleep surface is the best way to minimize the risk of SIDS as much as you can. The knock-off product you bought could still be used for baby to lounge on while awake and playing! Wishing you and your son all the best! You can most definitely buy this In canada. Just an fyi! I’m not a fan as well, but just to clear up the confusion. great article. couldn’t agree more! You may like to look up the statistics on co-sleeping when breastfeeding, it’s very safe provided parents are following safe co-sleeping guidelines. Baby sleeping next to mum when breastfed helps to regulate body temperature, heart rate etc. and it the norm in many countries. I could definitely see it being useful for while they’re awake, especially if you have hard floors. I’m glad someone gifted you one as the price tag is definitely too high. I know a lot of moms would be tempted to use it for sleep if they had one. Kudos to you for staying strong. I’m a “paranoid mom” too! Yes, I can’t wrap my head around the price tag. It seems crazy for what it is!